Austin Has a Sidewalk Problem. What Can the City Do To Fix It? Austin is missing half of the sidewalks it's supposed to have, and many sidewalks are not compliant with the Americans with Disabilities Act. While plenty of people are moving to Austin for the jobs, the outdoors and the lifestyle, the city is still missing something pretty important: sidewalks. Austin has only half of the sidewalks it's supposed to, and it will be a long time before it can fill in those gaps. We've put together this explainer on Austin's sidewalk situation. Wait, did I hear that right? Austin is missing half of its sidewalks? Yes — there are a little more than 2,200 miles of sidewalks absent in the city, roughly half of the sidewalks the city is supposed to have. And many sidewalks are not compliant with the Americans With Disabilities (ADA) act. At the current rate of city funding, how long will it take to fully build out Austin’s sidewalks? City funds are only building around seven to ten miles of new ones each year. So at the current rate of funding, it will be nearly 200 years before Austin has the sidewalks it needs. This is a problem. Most of the people that use the city’s transit system walk to their stations, and many others can’t afford to drive or are unable drive due to impairments. Sidewalks are an issue of not just safety, but also social justice, public health and affordability. So what's being done to fund more sidewalks? 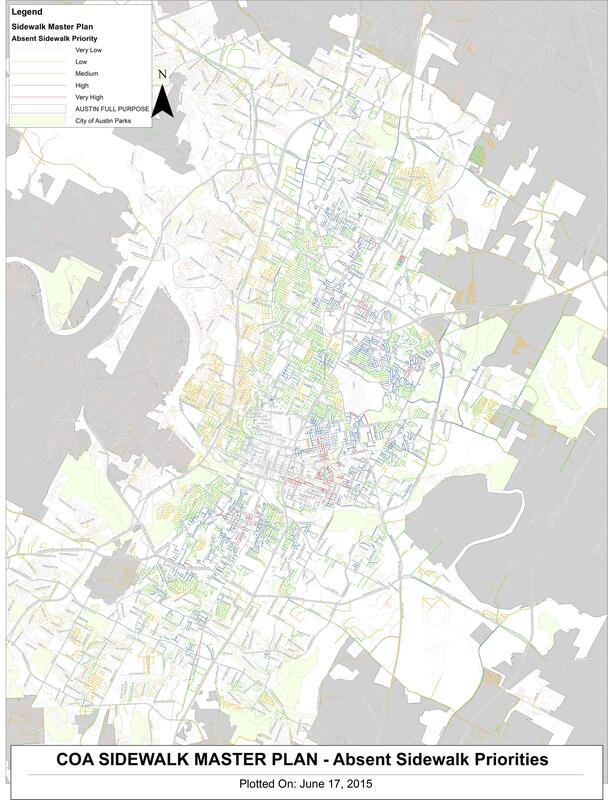 The missing sidewalks (and those that need to become ADA compliant) were identified in Austin's 2009 Sidewalk Master Plan, which is being updated this year. That plan also came up with a way to prioritize which sidewalks to build or improve first. But it didn’t come up with long-term funding for them. There are city funds, mostly from voter-approved bonds, to build new sidewalks and make existing ones compliant with the ADA. But those still only add up to less than ten miles of new sidewalks a year on average. Voter-approved bond money from 2012 for sidewalks will soon run out. In the meantime, there are some sidewalk improvements that come from regional or state agencies like the Central Texas Regional Mobility Authority or the Texas Department of Transportation. But at the city level, there are several sidewalk improvements that are being made possible by private development and parking meters. Take Downtown, for instance: There are now plenty of new or improved sidewalks, some of them designed as 'Great Streets,' with planters, benches, bike parking, lighting, trees and even the occasional piece of artwork. Nearly all of the money for those improvements came from private development. If there are all these nice new sidewalks downtown, why isn't the city building new sidewalks in residential areas where they're needed most? Actually, that's exactly what the city is doing. While the downtown improvements are the most noticeable, nearly all of the cost of those improvements comes from private development. There's also an option for neighborhoods to develop a Parking Benefit District (PBD), which essentially means putting in parking meters to help pay for new or improved sidewalks. One of the city's first PBDs is in the West Campus area, which is starting to see sidewalk improvements with the proceeds from the meters. To build the highest-priority sidewalks in the city, it will cost about $200 million. One option is to accelerate building the missing sidewalks within a quarter mile of transit stops and schools and trying to get sidewalks on at least one side of those streets, something that could be done within five years. To accomplish that, there would likely need to be a voter-approved bond. How are sidewalk improvements prioritized? Is public safety considered? Transit? Accessibility? All of those things and more go into the city's sidewalk prioritization process. Every absent sidewalk was analyzed, and now they have a map of priority missing sidewalks. The city realized they couldn't build all of Austin's missing sidewalks at once, so it developed a GIS-based prioritization tool. It takes into account pedestrian attractors, transit stops, public health, schools and other public buildings, demographic data, and density — areas with higher density are higher priority. It also factors in socio-economic data — lower-income areas are higher priority because they rely on transit more. There are 20 factors in all. 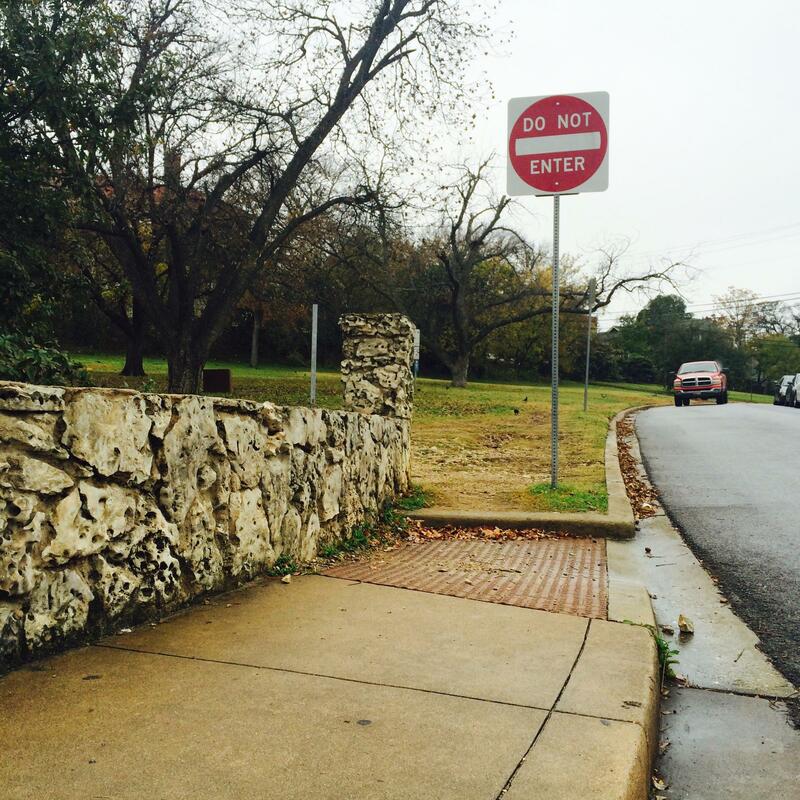 Is Austin in danger of an ADA lawsuit for deficient sidewalk infrastructure? That's what's happened in Los Angeles. There they had decided for some time that sidewalks were the responsibility of the adjacent landowner, and this year settled a class-action lawsuit for $1.4 billion for its deficient sidewalks. "You don't ask an adjacent landowner to fill a pothole in the street, why should they fix the sidewalk?" Eastman says. "They're both in the public right of way; they're both transportation facilities." In 1995, Austin changed its laws to make sidewalks part of city right of way and a public need that the city would address. "Austin deserves a lot of credit for taking on that challenge very early," Eastman says, noting the city's program to retrofit existing sidewalks to ADA compatibility and focusing on transit stops. Public Works is also partnering with Capital Metro to build sidewalks for bus stops. But a lot of work remains. Does everywhere in Austin even need sidewalks? Maybe not. There are some residential areas where streets are narrow enough that it's possible they could remain sidewalk-free, according to Eastman with Public Works. "I think there are significant areas in residential environments where it’s relatively low-speed, and one thing we’ll be looking at in the next Master Plan update is — 'What are the alternatives?'" Eastman says. "Because effectively they operate as shared street space right now. So how you can improve safety and functionality for all users on those streets without necessarily building a sidewalk?" One option may be more local traffic management on those streets, using traffic-calming devices and adding elements like speed cushions and medians. I've heard about a fee-in-lieu ordinance that lets developers pay a fee instead of building sidewalks. How does that work? According to Eastman, the city reviews closely requests to pay a fee instead of installing a sidewalk during development or re-development. Typically these exemptions are made for single-family residential projects only, and usually there has to be some kind of topographical constraint, or something like a heritage tree that would make it “logistically impossible” to put in sidewalks there. The fees paid for not installing a sidewalk go into a fund that stays in that neighborhood, Eastman says. "So rather than having one small stretch of sidewalk in an area where it may not be able to be connected in the future because of trees or topographic constraints, now that funding can go towards someplace where a sidewalk can be put in that ties the network together," he says. Why is the Sidewalk Master Plan being updated? The new plan will update the data for prioritization of building missing sidewalks. And it will start giving out grades for the sidewalks we do have. "We will be rating sidewalks on an A to F scale, and at that point we’ll be able to really prioritize sidewalk maintenance," Eastman says. In some cases, those fixes could be as simple as cutting back vegetation. The big question hanging over the process is money. With bond money running out soon, it's possible that sometime in the next few years, the city will ask voters to approve more bonds to fill in Austin’s many missing sidewalks like they have in the past. A good place to start is Austin's 2009 Sidewalk Master Plan. The city also has a citizen-led Pedestrian Advisory Council to get more public input on walkability and safety. It meets the first Monday of every month at 6 p.m. at 721 Barton Springs Road. Does Ticketing Drivers Make Pedestrians Safer? 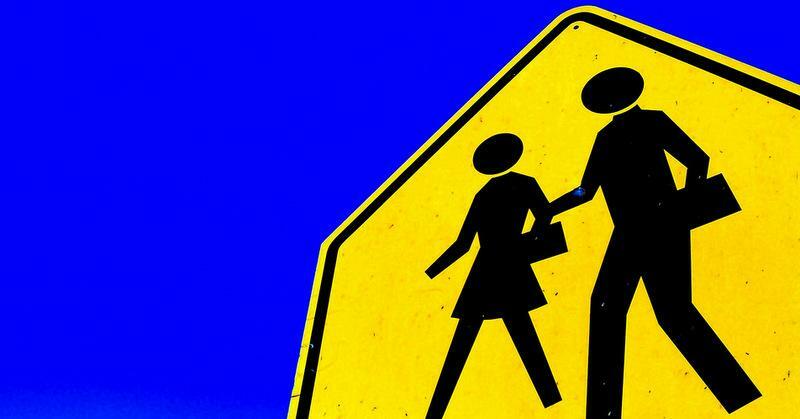 With a string of recent auto-pedestrian fatalities, the Austin Police Department announced it's enhancing its Pedestrian Enforcement Safety Team initiative by targeting drivers at crosswalks – and using officers as decoys. There have been eight pedestrians and bicyclists killed in crashes so far this year. Police Chief Art Acevedo said drunk drivers and drunken pedestrians contribute to Austin’s number of pedestrian deaths, but drivers that fail to yield to pedestrians are responsible for more deaths than drunk drivers. Austin is the country's 24th most dangerous metro area for pedestrians, according to a new report. "Dangerous by Design 2014" [PDF], a study from the National Complete Streets Coalition and Smart Growth America, examines pedestrian deaths in the country's 51 biggest metro areas. The study factors five years of data on pedestrian deaths (2008-2012) with the percentage of area commuters that walk to work to create a Pedestrian Danger Index. The Austin-Round Rock index is 78.6, well above the national average of 52.2. The area averages 1.44 pedestrian deaths for every 100,000 residents, which is actually somewhat below the national average of 1.56. Overall, the Austin-Round Rock area had 251 pedestrian deaths from 2003 to 2012.